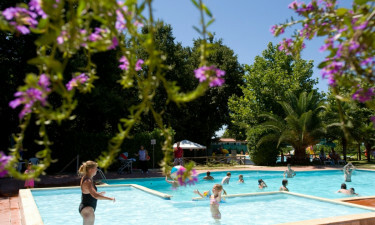 Situated near Fiano Romano, I Pini camping offers you a comfortable and relaxing stay in a natural countryside environment, set in woodland and oak groves on the hills overlooking Rome and the River Tiber. 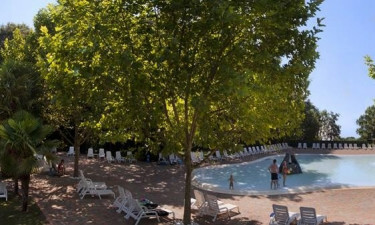 We know all about I Pini Family Park! Open from mid-April to mid-September, the campsite has good facilities and is within easy reach of the city to explore its centre. If you have already decided to book your camping luxury holiday at I Pini, Lux Camp will be happy to answer any questions. Lux-Camp provides luxury camping in mobile home accommodation. 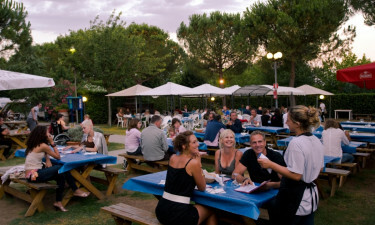 Why choose I Pini Family Park for your next holiday? Below you will be able to read more about the reasons why you should choose to go on holiday to I Pini Family Park. Local points of interest including a nature reserve, a park with monster sculptures and vineyards. Electricity is provided. Toilet and bathroom facilities are wheelchair accessible; a baby changing room is available along with washing machines and a tumble dryer. In addition to an activity area and entertainment for the youngest visitors, the children’s lagoon is ideal for playing in safety. For adults, the main 18-metre swimming pool is complemented by a Jacuzzi; a larger lagoon in gardens has reclining chairs to seat guests in comfort. Tennis, ping-pong tables and cycle hire are also available. The area is ideal for walking, pony trekking and mountain biking - or to combine the tranquillity of the countryside with exploring the city or Italian coastline. From the peace and tranquillity of woodland trees and beautiful views of the valley, the centre of ancient Rome is just a short journey away - with so much to do and see. As well as a tour of one of the local vineyards, the Park of the Monsters at Bomarzo makes an interesting excursion, with its impressive gardens and astonishing sculptures. Stroll past a fountain featuring Pegasus (the winged horse) and mermaids; see whales, bears, dragons, lions and even Hannibal's elephant with a Roman soldier. Other monuments include The Leaning House and The Temple of Eternity. There is also a nature reserve (Riserva Naturale della Marcigliana) on the road to nearby Tivoli. The modern restaurant and pizzeria snack bar have wide glass windows offering diners good views; there is also a takeaway menu. An ice cream parlour may be your next port of call for those sweet Italian desserts, not forgetting the small supermarket where fresh bread is on sale, along with other essentials and souvenirs. An on-site supermarket will provide all essential products for campers, which is open for the entirety of the camping site's season. Rome is only a hop away, so any other shopping needs can be met here.